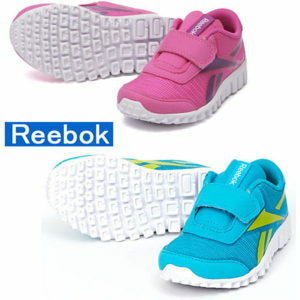 BOGO FREE Reebok Kids Shoes! Now through April 22nd, you can buy one select kids footwear and get another one FREE at Reebok! Just enter the promo code BOGOKIDS at checkout! 50% off Benefit Cosmetics Lip Products! 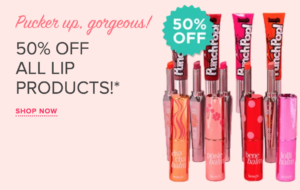 Now through April 30th, you can get 50% off select lip products at Benefit Cosmetics! No promo code needed. Ulta Beauty: $3.50 off $15 Purchase! Now through April 20th at Ulta Beauty, you can use a coupon to save $3.50 off your $15 purchase! If your shopping online, enter the promo code 788213 at checkout. 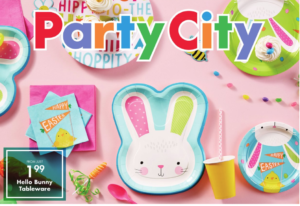 Party City: Hello Bunny Tableware starts at $1.99! Right now at Party City, Hello Bunny Tableware starts at just $1.99! Plus, you can use a coupon to save $10 off $60, $15 off $80 or $20 off $100! Valid in-store and online. Enter the promo code SAVEMORE at checkout! 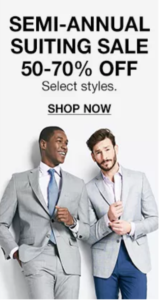 $99.99 Select Men’s Suits at Macy’s! Now through April 22nd, you can get select Men’s Suits for just $99.99 at Macy’s! They regularly sell for $375. Plus, enter the promo code SALE at checkout to get 20% off your purchase! Nike: Extra 20% off Sale Items! Now through April 21st, you can get an extra 20% off sale items at Nike.com! Just enter the promo code SAVE20 at checkout! H&M: 20% off $60 on ALL Kidswear + FREE Shipping! Through April 15th, you can spend $60+ on Women’s, Men’s, Kids & H&M Home and save 20% off your kids purchase + FREE shipping at H&M! Just enter the promo code 3367 at checkout. Valid in-store & online. Kate Spade: Extra 30% off Sale Styles! Through April 22nd, you can get an extra 30% off sale styles at Kate Spade! Just enter the promo code JOYSOFSPRING at checkout. Jos. A. 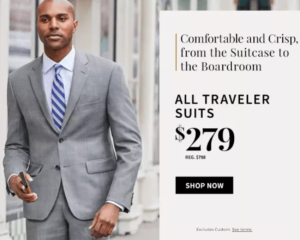 Bank: $279 Traveler Suits! Through April 14th at Jos. A. Bank, all traveler suits are on sale for $279! Regularly sells for $798. 80% off Ralph Lauren Blankets at Macy’s! 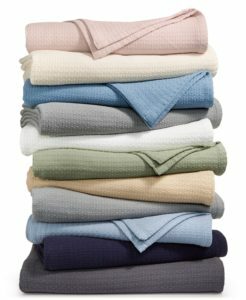 Right now at Macys.com, Ralph Lauren Classic 100% Cotton Blankets are 80% off! Valid on all sizes! Shipping starts at$9.95 or is free with $99. To avoid shipping fees, ship to your local store for free in-store pickup.